TFW the deal’s totally acceptable and you have no qualms to any and all last-minute alterations or reneging. 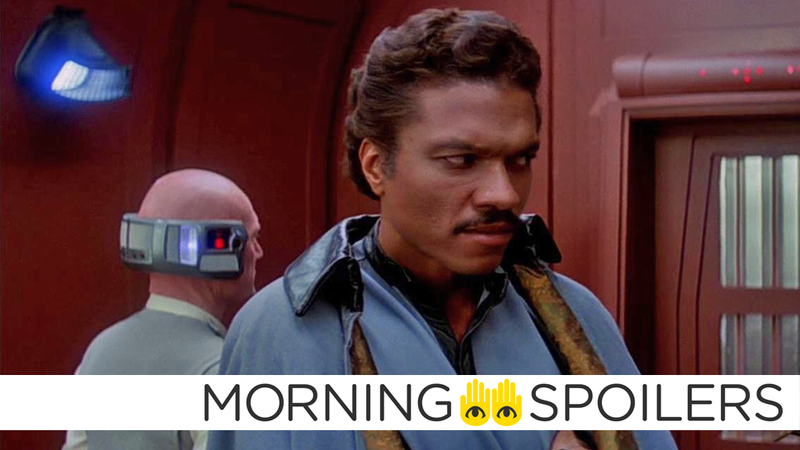 Meanwhile, salt shakers at the ready: a Reddit user claiming to be an extra on Episode IX reports Naomi Ackie will play Lando’s daughter, Veranada (Vera) Calrissian. According to Revenge of the Fans, Carl Reiner, Mel Brooks, and Alan Oppenheimer (Skeletor from He-Man and the Masters of the Universe), have joined the voice cast of Toy Story 4 in undisclosed roles. Deadline also has world Stanley Tucci has joined the cast of the Kingsman prequel, alongside—deep breath—Ralph Fiennes, Rhys Ifans, Daniel Bruhl, Matthew Goode, Harris Dickinson, Aaron Taylor-Johnson, Gemma Arterton, Tom Hollander, Robert Aramayo, Djimon Hounsou, and Charles Dance. On the latest episode of the ComicBook Nation podcast, Jim Viscardi reports Henry Cavill has indeed shot a cameo for Shazam!, but it will only see the light of the day if the actor’s contract is renewed. Deadline reports Alistair Legrand (Clinical) has been hired to direct the film adaptation of Stephen King’s 2011 novella, Mile 81, concerning a 12-year old boy and his brother combating a “mysterious force” inside a boarded-up rest stop. Ernie Hudson revealed he’s spoken to Jason Reitman about the upcoming Ghostbusters reboot/sequel during an interview with the Television Critics Association. I reached out to Jason. I’ve talked to Jason. I’ve also had a conversation with Ivan [Reitman] just to congratulate him. They confirmed that the movie is definitely being made, because you know there’s always been rumors with Ghostbusters the last 30 years. What that’ll look like, they did not share. Nobody’s offered me a job, but the reason I wanted to reach out to Jason, I remember him as a little kid on the set of Ghostbusters. The fact that he’s stepping into that, I think the fans have been wanting it so no matter what happens, I know it’s going to be a great movie. I really respect him as a filmmaker. Obviously, I’d love to be a part of it but that hasn’t so far presented itself. I know that the movie will be good. Speaking to reporters at the Television Critics Association, Michael Douglas confirmed “there’s been talk” of a third Ant-Man film. Gasp! There’s been talk [about another Ant-Man]... [but] there’s been nothing formal right now that I know of. They always kind of spring it on me. The first time you hear about it, it’s already in its third rewrite. Also speaking to the Television Critics Association, Zachary Quinto offered an incredibly vague update on a potential fourth Star Trek movie set in the Kelvin Timeline. According to MovieHole, Disney is allegedly considering a sequel or live-action remake of The Nightmare Before the Christmas. Bloody-Disgusting has two new posters for the Pet Sematary remake. Captain Marvel is “kind of done” with her critics in the latest TV spot. A new documentary explores the fandom of the 1980 Flash Gordon film and Sam Jones’ career afterward. Collider reports Josh Duhamel and Leslie Bibb will play the series’ “two married leads” while Andrew Horton and Elena Kampouris will play their children. Ben Daniels and Matt Lanter have also been cast as Duhamel’s brother and best friend, respectively. Previous CW star Chad Michael Murray revealed he’s coming back to the network. He’s been cast as the leader of the cult known as The Farm. Meanwhile, Star vs The Forces of Evil creator Daron Nefcy revealed the series will end with season four in a recent interview with TV Line. We put our heart and soul into this final season, and can’t wait to celebrate the exciting conclusion of the series with our fans who have remained so loyal throughout this journey. Deadline reports a new anthology series based on the EC Comics’ series, Weird Fantasy, is now in development at Hivemind—the production company behind Netflix’s The Witcher and Scary Stories To Tell in the Dark. The outlet also reports Hivemind is developing a biopic on the controversial EC Comics publisher, William M. Gaines. Speaking with Television Critics Association, executive producer Jeremy Carver revealed Doom Patrol will include appearances from Celsius, Lodestone and the Beard Hunter (!) alongside the previously announced Danny the Street. I think the show is dipping into different versions of the Doom Patrol from the years. A great jumping off point is the Grant Morrison run in the ’90s [and] we dip into the Silver Age where we are seeing the Celsius and Lodestone characters. We’re going to see some other characters that have graced over the years, such as Danny the Street. We’re going to see one of my more beloved characters, the Beard Hunter. In terms of where we’re going with the storyline, we’d rather let the story grow itself week to week, and let the fans discover the show for themselves. Meanwhile, the latest trailer gives us our first look at Alan Tudyk as Mr. Nobody, the leader of the Brotherhood of Dada. Spoiler TV has an official synopsis for season two. THE TERROR: INFAMY - The second installment of the horror-infused anthology, The Terror: Infamy began production on January 14 in Vancouver, Canada. Set during World War II, the haunting and suspenseful 10-episode season centers on a series of bizarre deaths that haunt a Japanese-American community, and a young man’s journey to understand and combat the malevolent entity responsible. Renowned actor, producer, author and activist George Takei (Star Trek) serves as a consultant, as well as series regular, while Derek Mio stars as Chester Nakamura. Season two is co-created and executive produced by Alexander Woo (True Blood) and Max Borenstein (Kong: Skull Island and Godzilla). Woo also serves as showrunner. Spoiler TV also has photos from episode six of Deadly Class, “Stigmata Mary.” More at the link. Zachary Quinto plays a supernatural body snatcher in the first trailer for AMC’s NOS4A2.